Family Branch 1 - This is the main skeleton of the Pitcairn Family, from where all others are linked. From Walter de Pitcatcaairn, Assize at Dunfermline, Scotland before 1249 and John de Petcarn, 1st Laird of Pitcairn and Innernethy in 1250; down to the present John Pitcairn 27th in descent. 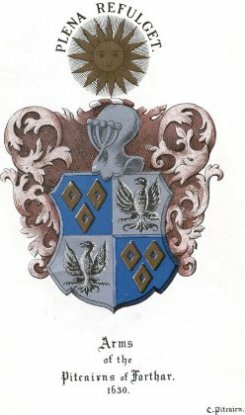 Family Branch 3 - The Pitcairn's of Pitlour, from Henry Pitcarne 1st Laird of Pitlour 1504 - until the Skene family of 1696. Family Branch 10 - The Pitcairn's of Dysart, from the Rev James Pitcairn, Minister of Kettle. Copyright © 2002 Sheila Pitcairn. All rights reserved.